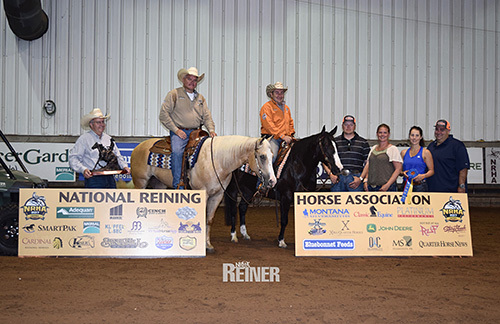 In a field of 219 horse and riders entered in the $181,000-added 2017 NRHA (National Reining Horse Association) Derby, posting the top score in the Level (L) 4, was Dr. William ‘Bill’ Rhoads of Whitesboro, Texas riding Mega Maggie Mae. Aboard the 5-year-old mare by NRHA Four Million Dollar Sire and NRHA Hall of Fame inductee Magnum Chic Dream and out of Cinco De Mega – nominated by Martin Bonneson – Rhoads posted an outstanding 223.5 in the second section of the qualifier. 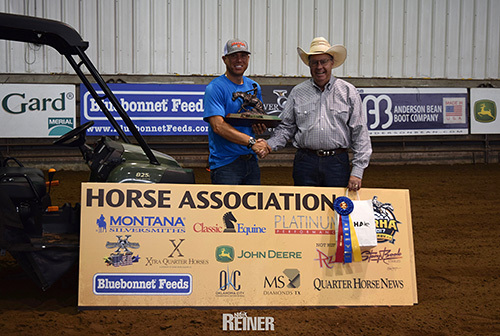 “My mare is amazing, and this is the highest score we’ve ever posted together,” said Rhoads about his mount, with whom he slid to the 2015 NRHA Futurity Levels 3, 2 and 1 as well as the 2016 NRHA Level 4 Non Derby Championship. “What did we do to get ready for today? We simply kept her happy and jogged her every day!” Mega Maggie Mae boasts $119.000 NRHA LTE. David McBurney and his Fancy Steppin Whiz, a 5-year-old stallion by RC Fancy Step out of TC West Coast Wendi (nominated by McBurney), took the lead in the L3 division of the Non Pro Derby with a 218 in the first go of the first section held on Monday. McBurney had set the bar, and in the second section, Chloe Lawrence tied to win the L3 division with a 218 and topped the L2 and L1 Non Pro divisions aboard the Lawrence Ranch owned 6-year-old mare, Whiskymakesmefrisky (Topsail Whiz x DN Smart Snap). McBurney held on to the lead in the Prime Time Division. Cade McCutcheon and Duallin Guns (Mister Nicadual x Always Gotyer Guns Up), nominated and owned by McQuay Stables Inc., scored a 217.5 to lead the Youth Non Pro division. With a 218 score, Frederick Christen and his 5-year-old mare, Xtra Voodoo Step (Wimpys Little Step x Voodoo Chic), nominated by Xtra Quarter Horses LLC., posted a 218 to lead the Masters Derby Non Pro division. Open riders guided their horses through NRHA pattern #9 in the Adequan Arena on June 27 for the $1,000-added Novice Horse Open Level 1 and $2,000-added Novice Horse Open Level 2 classes. Brian Welman and Dany Tremblay both marked scores of 146 to earn $822 and tie for championship honors in the Novice Horse Open Level 2 class. Welman rode Cielo Dreaming (Magnum Chic Dream x Shiney Cielo), a horse he’s ridden for about a year, owned by Craig Vernon. The gelding came from Calcagnini Reining Horses in Pilot Point, Texas, and has found a successful show home with the Vernon family, who train with Welman in Hastings, Minnesota. Overbrook, Oklahoma-based NRHA Professional Dany Tremblay piloted Misters Temptress (Mister Dual Pep x Colonel Pepinic) to tie for the win. Adh-Mor Ranch owns the 2012 mare, and Tremblay says she has really started to come into her own in the show pen this year. The mare has a strong personality that adds to her performances. Despite being a little out of shape after a two-month break, Tremblay says she still gave her all in the class. Tremblay plans to continue gunning for the NRHA World Championship in his division by entering as many novice horse classes as he can. “She’s kind of like my little pet—I bring her everywhere,” Tremblay said. Matthew Palmer and Gunner Be A Maverick (Gunner x Dun It Preciously) earned third-place honors in the Level 2 with a 145 – for $497 – in addition to winning the Level 1 class, adding an extra $589 to his earnings. The gelding, owned by Mark Hurd, was purchased for his daughter Elena Hurd to have a mount to get qualified for the SVAG FEI™ World Championships for Juniors and Young Riders in Switzerland. Palmer found Gunner Be A Maverick, a 7-year-old mount with a very limited show record through NRHA Three Million Dollar Rider Craig Schmersal. With some tuning and miles, Gunner Be A Maverick has already won at the only two shows Palmer has entered him so far. Palmer will hand the reins to Elena Hurd for the youth classes during derby week and plans to show the gelding himself in a CRI qualifier for the World Equestrian Games (WEG) in New Jersey next week. The reserve championship slot saw a tie between NRHA Professionals Nathan Piper on Xtra Dun Right (Wimpys Little Step x SLJ Dun Juice), owned by Shannon and Hershel Reid, and Jared Leclair on The Dun Gun (Gunner x Fabulous Footwork), owned by Jenifer Seago. Both scored a 144.5 to earn $407.